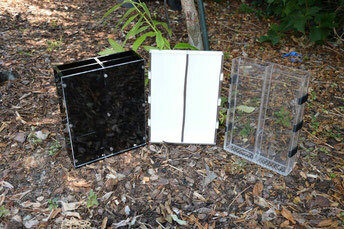 Rhizobox / root box systems. Different designs are used to i) separate rhizosphere soil from bulk soil, ii) are a feasible ways to study different aspects of soil–root interactions, iii) to measure root growth, turnover and depth distribution and iv) to sample defined root types (e.g. age classes, orders). The flat surfaces (immersed screws) allow for space optimized placement (e.g. important in growth chambers) and easy picture acquisition with scanners. Roots on rhizobox images can be analysed with free or commercial software programs (see bottom of page), however, rhizoboxes are also an educative way to illustrate both root and shoot growth to younger students ("root viewer"). Continue reading on Rhizoboxes and access the Rhizobox configuration sheet. 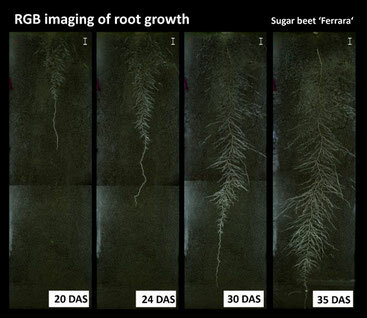 Sugar beet cultivar imaged with RGB camera. (c) Image property of Gernot Bodner, BOKU. Large rhizobox imaging. We are currently in the final phase of developing an imaging system for large rhizoboxes not fitting commercially available scanners (A4, A3). This is foreseen to solve stitching or reflection problems as common with camera-based imaging (see image on the left) and to increase the user friendliness, repeatability and interpretability (especially in regard to segmentation). Stay tuned. Please check the Plant Image Analysis Webpage (carefully collected by Guillaume Lobet and colleagues) for further software packages allowing root analysis. Please fill in and save (or scan/take a photo of printouts); include additional sheets as required. Clearly number (#) all forms if you request quotes for several rhizobox designs. Send to office@vienna-scientific.com for quoting (and as reference for potential manufacturing). Additional design changes require written confirmation! Beyer, F., D. Hertel, K. Jung, A.-C. Fender, and C. Leuschner. 2013. Competition effects on fine root survival of Fagus sylvatica and Fraxinus excelsior. Forest Ecology and Management 302:14-22. Gonkhamdee, S., A. Pierret, J. L. Maeght, V. Serra, K. Pannengpetch, C. Doussan, and L. Pagés. 2010. Effects of corn (Zea mays L.) on the local and overall root development of young rubber tree (Hevea brasiliensis Muel. Arg). Plant and Soil 334:335-351. Hylander, L. D. 2002. Improvements of rhizoboxes used for studies of soil–root interactions. Communications in Soil Science and Plant Analysis 33:155-161. Schmidt, J. E., Lowry, C., Gaudin, A. C. 2018. An Optimized Rhizobox Protocol to Visualize Root Growth and Responsiveness to Localized Nutrients. J. Vis. Exp. (140), e58674. Spohn, M., A. Carminati, and Y. Kuzyakov. 2013. Soil zymography–a novel in situ method for mapping distribution of enzyme activity in soil. Soil Biology and Biochemistry 58:275-280. Yao, Q., H. H. Zhu, J. Z. Chen, and P. Christie. 2005. Influence of an arbuscular mycorrhizal fungus on competition for phosphorus between sweet orange and a leguminous herb. Journal of Plant Nutrition 28:2179-2192.